Home » Travel » Not Your Standard Belgian Postcard! Not Your Standard Belgian Postcard! Not unusual in itself, but a very Indian Jain temple in the heart of the quiet Wilrijk neighbourhood of Antwerp was a most astonishing discovery. I had never heard of it until my daughter’s friend – a Jain herself – who serendipitously happened to be visiting her parents in Antwerp, insisted on showing us around. 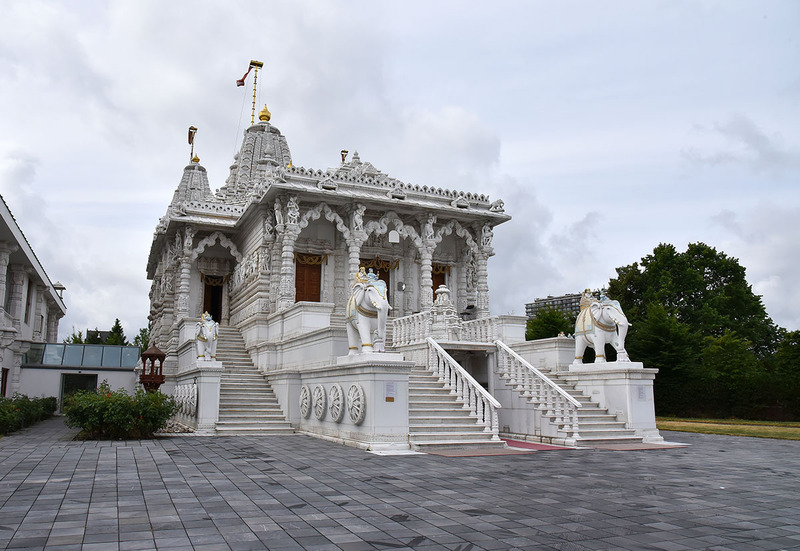 The ornate marble structure, completed in 2010 and funded by the Indian diaspora – mainly Gujarati Jains in the diamond business – is purported to be the largest Jain temple in Europe, perhaps the largest outside of India. The craftsmanship is exquisite, especially the pristine white principal idol of Parshvanath (the 23rd Tirthankara), and the lapis inlay on the floor around the sanctum. For all its translucent magnificence, I found the temple as incongruous in its suburban European setting as I did Gehry’s spectacular hotel in the Rioja valley. My visit to Belgium was prompted by a modest Airbnb voucher I had earned, and my (American) sister’s desire to join me on an Euro trip I had been planning in order to utilise the voucher. She just had a week to spare in April, and we opted for Belgium for its size and ease of travel. It was a crazily impulsive decision considering my older sister’s husband hadn’t yet fully stabilised. Sure enough, he took a turn for the worse, and we came close to losing hope for a while. The (American) sister’s calendar was tight, with her daughter’s graduation coming up in May, as well as her July visit to India, so she cancelled. I rescheduled for late June, since insurance companies in India do not cover – at least I do not know of any that do – ‘cancellation for no reason’. Come June, I was in no mood to travel solo and happened to mention to a young friend I was out at lunch with, that I might be cancelling after all. She called back the next morning to say she would gladly join me and that’s how I found myself a lovely travel partner, as crazy and impulsive as myself. My absence from the blog since our return in early July was a digital detox in honour of my visiting sister. We got to bond after all, even if it wasn’t in beautiful Belgium. And the brother in law is on the mend and finally – miraculously – off the ventilator! So all’s really well. Stay tuned for more Belgian postcards from Belgium. PS: Having issues with WP again. Am having to log in for every response on my own blog and each comment I leave on yours. Thankful I am not persona non grata this time. Please bear with me while WP engineers sort it out, hopefully soon. I certainly wouldn’t have expected a temple in such a place. 🙂 Glad to read that your b-i-l is dong so much better and good luck with WP. Sigh. I think it is punishment for staying away too long 🙂 Responding from my admin page seems to be a good workaround. Have a lovely weekend Janet. I love Belgium! I’ve never seen this temple. Can’t wait to see what else you’ve discovered that I’ve missed. Ha, probably little else, I would never have discovered this without my local contact. I didn’t expect to love Belgium as much as I did Juliann. Antwerp is one of the worlds top diamond trade hub. Diamond trade in India is dominated by Marwari Jain community, mainly from Palanpur. So, not surprising. It was still a huge surprise to come upon it in that setting Bhawna. More about your trip and I am glad you are back to writing! A digital detox is very healthy! Welcome back Madhu – as always and interesting read and a great choice for the challenge. Hope WP fixes your issue quickly, how annoying for you!! Thank you very much Tina. No change so far. I am currently cutting and pasting my password after every response! Those little anomalies are the best! I find all sorts of them here in my new city of Houston, a place people think is all cowboys and oil rigs. In fact, it is the most diverse city in the U.S. (and there is no zoning), so I often happen upon a Hindu temple or a Sub-Saharan center right next to a burger joint or muffler shop! I love that you went ahead with your trip with a last-minute travel mate! Houston sounds like just the kind of city I love to wander in. Digital detox! I like that, and think we all need to have one from time to time. I will get mine during my daughter’s visit in a couple of weeks time. She lives in the US so I don’t get to see her often and will gladly give up the internet willingly during that time. I wish I’d seen that temple during my visits to Belgium when my daughter and her family lived there. They itinerated through the surrounding countries often and we saw a lot, but not that temple. What an exquisite little temple. I’d love to see the inside. And Gehry buildings are always amazing! Glad to hear your BIL is on the mend, and that you had a sweet little vacation in Belgium. Thank you Alison. Photography was unfortunately prohibited inside the temple. This was the post I spotted on Twitter on my phone but I couldn’t open the link to it. (it’s a very poor specimen, rather like myself 🙂 ) Glad I found it because it’s full of news, Madhu, and most of it good! Fingers crossed that it’ll only be good news from here on. Interesting what a treasure you have found in Belgium, never would have expected that, there. Anyways welcome back to posting, it’s been a while and I missed your wonderful posts. Thank you Cornelia. Happy to be back. The Jain temple looks lovely. I’m glad all ended up well — your brother in law’s health, your sister’s visit to India, your trip to Belgium, and that little discovery in Antwerp. Following your short travel journals from Belgium was really fun — that serendipitous encounter with that friend of your cousin’s, the hair dryer story, and all. Although I’m sorry that you lost your wallet there. Looking forward to more posts on Belgium! Haha, I was just teasing my friend, Bama. Her family has a running joke about her hairdryer and I was just adding grist to the mill. She was a great travel companion to have when I was (strangely) in no mood to travel and I wouldn’t hesitate to travel with her again. Truly relieved my brother in law is better. And grateful for my sister’s perseverance and strength. Cannot tell you how many people suggested a few months ago, indirectly and otherwise, that we should turn off his ventilator!!! Ha most welcome Callum 🙂 Have a great weekend! Last part gave me good chills, Madhu. I am so glad to know all is really well now. Thank you Riba. Yes, much, much better. What an unexpected sight, Madhu! Just imagine how it would look with a reflecting pool to add even more luster to all that marble. Reading about it makes me wonder if there are any standalone Jain temples here in Jakarta (there’s a small community concentrated in the north-central neighborhoods). So happy to hear that your brother in law is finally off the ventilator… and that the trip to Belgium did eventually happen! Strange that I hadn’t heard or read about the temple before Payal mentioned it. Curious about the Indonesian Jain community. They will surely have plans to build one if they don’t have one already. Thank you James. My brother in law went into intensive care in mid October last year! The final stretch to recovery and complete weaning from oxygen is proving painfully slow. Grateful that the ventilator is off though. More or less in the same boat Gilly. Things looking up generally, but still too many demands on my time. All material on these pages, including  with out limitation text, logos, icons,  photographs and all other artwork, is licensed under a Creative Commons Attribution-Non Commercial-No Derivatives 4.0 International License.